Many of you know that I have a few hobbies: Music; neuroscience; scripture memorization; reading novels and almost all of Louis L’Amour’s books; and reading accounts of miracles, answers to prayer, and angel appearances. I just read about a fighter pilot who needed to land on an aircraft carrier. This incident occurred in 1958 east of the Sea of Japan, and the account I read was written by the pilot. 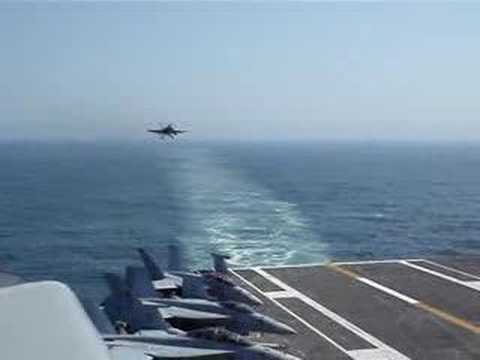 A nearby typhoon churned the waters so that his first six attempts to land on the carrier were unsuccessful. Each landing consumed 150-200 lbs. of fuel. The pilot had only enough fuel for one more try. If he were unsuccessful, he would end up cruising into the waves where planes often break apart. This would be certain death. The pilot’s other option was to climb to a higher altitude and eject. With the coming storm and the mountains of waves, he thought that he would not be found in the sea. He believed that this second option also spelled certain death for him. He decided to try to land the plane one more time, saying a passionate prayer to God for his safety. He states, “I prayed out loud into my oxygen mask but not over the radio: ‘Lord Jesus Christ, I need your help now or I will die. This is beyond my ability to control.” He also prayed that he wanted to see his family, but he added, “I accept your will. I will fly this plane to the best of my abilities until the end.” Someone said, “It’s important to live well, and it’s important to die well.” The pilot was prepared to do either. Suddenly, the pilot felt great peace. As he approached the ship, he was amazed by what he saw: The ship “appeared to be floating on top of a huge upwelling of water. The waves were not penetrating the upwelling and the ship was floating level as in a calm sea. “This lasted for some 20-25 seconds. Just as the tail hook engaged the arresting wire, the divine assistance ceased and the ship heeled sharply to starboard. But I was safely aboard.” Apparently, no one else saw the calmness that surrounded the ship for the short time of the landing. With thousands of miracle stories being written about by credible folks such as fighter pilots, firemen, children, high school and college students, and people from all walks of life and from around the world (and many such accounts that are equally incredible have been told to me personally), it’s hard to imagine how God seems to be hidden from some people. His ways may often be inscrutable, as “Clouds and thick darkness surround him” (Psalm 97:2), but those who seek Him find Him. What a beautiful story. I do believe God covers all details in our life when we cry out to Him no matter how big or small our issues may be. Thank you for sharing this mans testimony. God bless. God bless you, too, Amanda. I’m continually amazed at the stories I hear or read that uncover God’s love and His ways. As with you, I’m sure, I want to know Him better every day; and as illustrated by this story, I want to be constantly aware of His eagerness to both hear and answer our prayers. Amanda Lynn, I’ve come to know you as an encourager. You truly understand the power of God and His great love for us. As you said, it is God’s pleasure to “cover us” even as we pursue the “smallest” of endeavors. Who are we to say what’s small and what’s big? Jesus “made himself of no reputation” when He took upon Himself the form of a man. Yet now He fills the universe! Thank you so much for your comment!